In cooperation with Roxette’s Management and Live Nation we are happy and proud to offer you the chance to enter the Palau Sant Jordi arena in Barcelona on November 19th, 2011 before everyone else does. This means that you and a couple of other lucky winners will be able to enter the venue some minutes before the doors are open to the general public. Regular entry will begin soon afterwards. – The neverending Roxette tour goes on next year, name one of the countries Roxette has planned to visit in February-March. The winners will be chosen randomly amongst all participants who answered the question correctly. The contest will run until Tuesday 15th of November 18:00 CET. Don’t forget to read the small letter below. – we will randomly pick the winners among all valid emails (valid means: with name, nickname, cell phone number and correct answer). – the winners will be notified latest on 17th of November and will be required to reply to the email confirming their attendance to the concert. – further instructions where/when to meet will be sent per email or SMS probably on the day of the concert. If you are not at the meeting point at the agreed time, the prize will be given to somebody else! – the winners will have to have a valid ticket for the concert and are responsible for their transport to and from the venue and any costs that might arise. – the prize is for one person only, so the winners won’t be able to take their friend(s) with them. – Roxetteblog will not enter into any correspondence regarding the result of the contest. – in the event the priority entry is cancelled for any unforeseen reason, no other prize will be offered as replacement. – last but not least, be ready to have fun!! Are you from the Middle East? 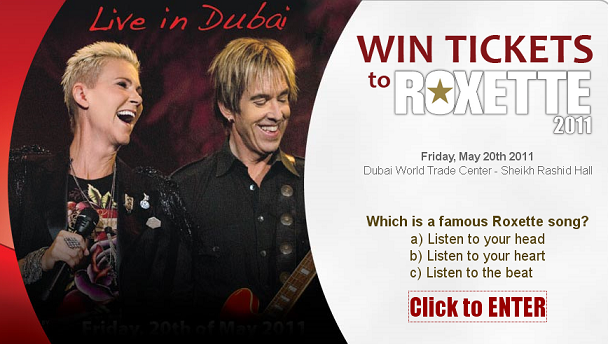 You have a chance to win a double-ticket for the forthcoming show in Dubai. Just enter this competition osnetwork.com and asnwer a very simple question – you have time only till tomorrow.